With the London Marathon looming on the horizon (less than two months away) Brett Swiffen and Rachel Calvert decided that they’d better get some miles in. Which is why, while many Pumas were trundling through the woods around West Vale and Copley in the Winter League, these two were to be found at Harewood House. But though Brett and Rachel may have a passing interest in Chippendale furniture and the magnificent Lancelot ‘Capability’ Brown landscaped gardens and other delights housed within, that’s not why there were there. 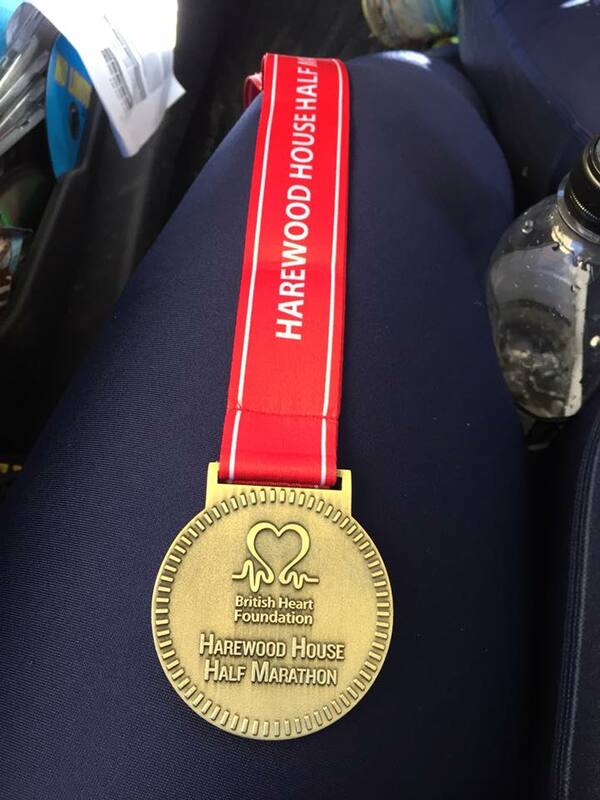 They were on a serious mission that involved dragging themselves around the Harewood House Half Marathon. 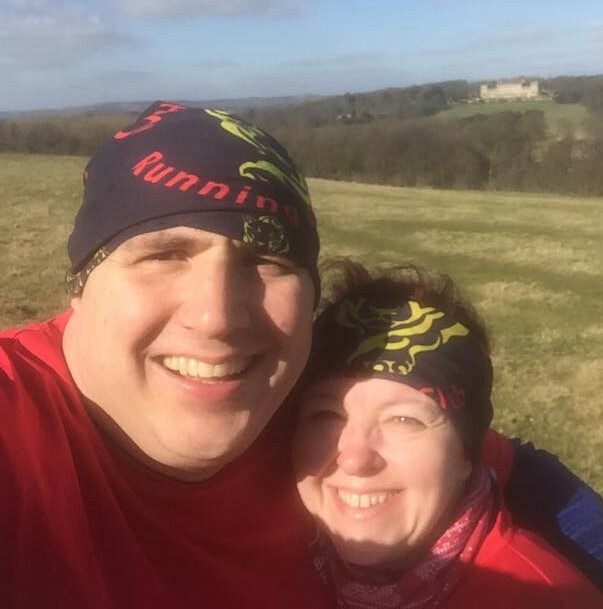 Brett and Rachel pose for the ultimate pre-race selfie – Harewood House in the background looks about three miles away! I use the word ‘dragging’, but not in detrimental terms, for it’s fair to say Brett and Rachel’s run wasn’t without incident. It’s not as if the course wasn’t hazardous enough but when both runners suffered mishaps en route, that they got around at all is testimony to their determination. This should stand them in good stead for the streets of London. The organisers of the event – they also staged a 10k run, but that wasn’t far enough for Brett or Rachel – advertised the event thus; “This extremely hilly route offers a challenging trail run with miles of muddy tracks, steep forest inclines and tree-lined fields, all set within the stunning grounds of Yorkshire’s historic Harewood House.” So the warning signs were clearly there long before they’d set off. When you’re running having pulled a calf muscle six days prior to the race, as Rachel did, then there are added worries, and any runner who has set off with injuries on their mind will know what she was going through. Sadly, Rachel’s injury flared up within minutes of setting off, but she soldiered on, determined to get through. Then, around the eight-mile mark, Brett took a tumble that, in his own words ‘Ronaldo would have been proud of.’ He picked himself up and together, he and Rachel completed the last five miles or so. Officially, Rachel pipped Brett by one second and one place, finishing 815th in 3 hours 28:12. That’s it, they did it. And it was well worth it in the end. 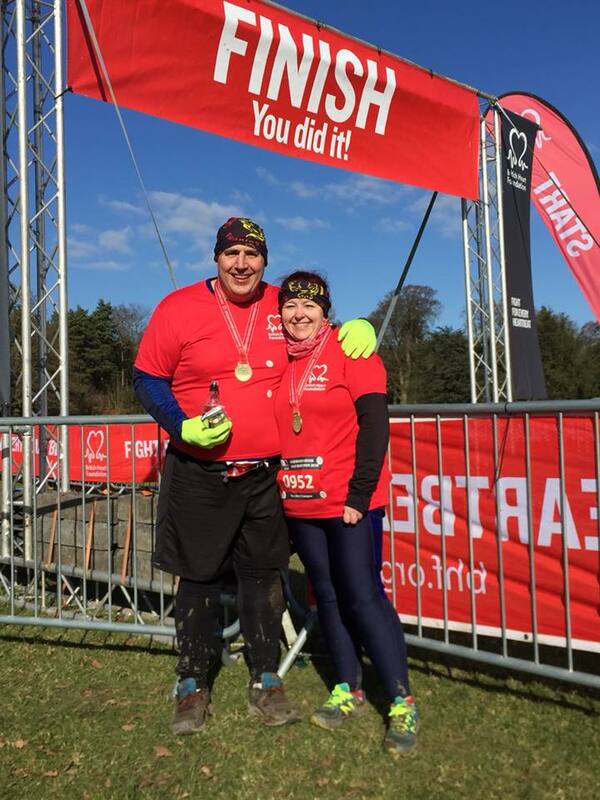 Having recovered, Rachel admitted that the race had been ‘the hardest mental and physical challenge yet’, whilst Brett added that the ‘muddy course was a killer’. But, they are now one step closer to London, and with a few 10ks and a twenty-mile run to complete next month, they are well on track.